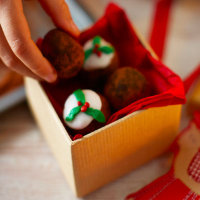 Have fun mixing and rolling these tasty truffles for the perfect homemade gift. They're really easy to make so children could help too. 1. Break up the chocolate and place in a heatproof basin over a pan of very gently simmering water (making sure the bottom of the basin doesn’t touch the water). Leave until melted, then stir until smooth and remove the bowl from the pan. 2. Stir the cake crumbs and ground almonds into the warm chocolate, mixing well. When cool, chill the mix in the fridge for 30 minutes. 3. With cool hands, roll the mixture into balls, using about 1 heaped tsp for each, then lightly dust with the cocoa powder. 4. Set the truffles in petits fours cases. If you like, decorate them as mini Christmas puddings with white tops, holly and berries, using Dr Oetker Writing Icing Brights or coloured icing. Chill until firm, then set in decorated boxes. Eat at room temperature.